Ike and I would like to wish all our friends and family a very merry Christmas, happy Hanukkah, and a joyful holiday season. We hope this time is filled with laughter, fun get-togethers, and yummy holiday treats. Ike is hoping that one day mom will give up the tradition of placing things on his head or that he grows a little taller so I can no longer reach the top of his head. I am hoping for a mild winter and safe footing so we can continue riding through the colder months. I am also secretly hoping for clean changes and fluid half pass steps. What that means is that it is time to drag out the fleece lined riding breeches, Thinsulate winter boots, and thicker gloves stuffed with Hot Hands. It also means that I look like I am crying while I ride since my eyes tear in the cold, and my nose and lips will be permanently chapped and cracked until April. I know, it is a picture-perfect look. 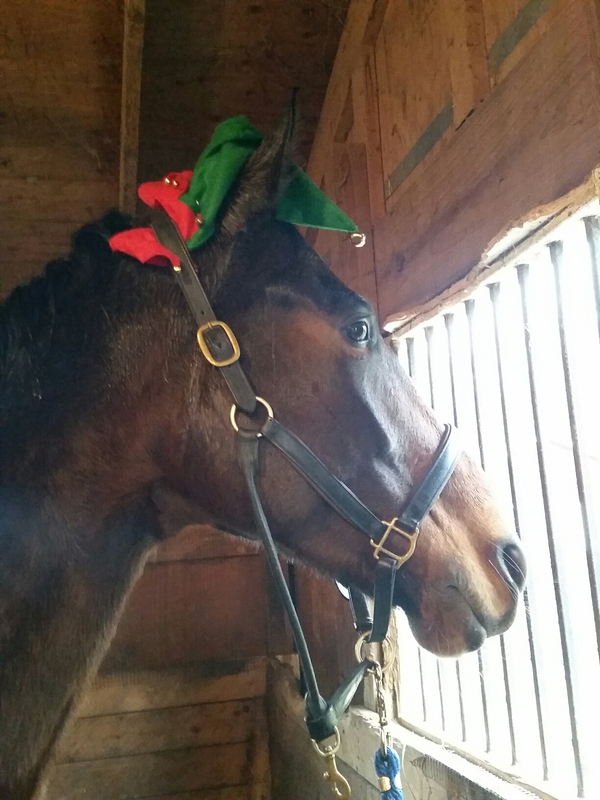 Those of us who weather the winter conditions also know that our horses transform into different beasts once the thermometer dips and stays well below 50 degrees. Tiny demons take up residence in their ears encouraging naughtiness and crazy antics while in their paddocks and while under saddle. Yes, even Ike can be led down the naughty road…the threat of telling Santa appears to have no effect on his behavior. Thus far this winter, Ike has destroyed two fence boards and one fence post. You read that correctly, he snapped a fence post with not a scratch on his body. He also decided to rear, buck and cavort up and down the fence line just as the vet was administering Cigar’s antibiotic shot. Cigar decided that he should join the fun, so I had to let go of the lead rope rather than get dragged through the mud. Many thanks Ike for “helping.” He has also resumed his wood-munching habit and more chicken wire has been installed on the boards around his coop stall. Tacking my demon-infected horse is much more challenging given that Ike seemingly generates a generous amount of static electricity. I do my best not to shock him, but inevitably, we both get a jolt or two as I remove mud, shavings and other unidentified material from his coat. Ike also is less than patient as I chip out the packed mud and manure from his hooves. I now need to be very aware of where my feet are in relation to his hooves or I get stomped on as he jerks away his hoof. Good times. His hatred of the tightening of the girth is also magnified in the winter. Nipping and cow kicking are standard practices in Ike’s world. Smacking and yelling are mine. Unfortunately for me, my winter boots are a bit bigger than my summer boots, so my usual spurs don’t easily fit around the heel. I tried riding without spurs and using my Prince of Wales spurs, but Ike scoffed at my leg aids, “Mom, I cannot hear you!” Fine, Ike, mom knows how to stretch my pointier spurs. Problem solved. Over the span of 10 days, I’ve also determined that our collected canter has gone south with the snow birds. We have fast canter, faster canter, fastest canter, super warp speed, and no absolutely no brakes in the snaffle bridle. These canter speeds make schooling flying changes challenging if not impossible. It is hard to be subtle, yet clear with your aids when you are hanging on for dear life and praying that you don’t snap another fence post or your neck. What is a girl to do if she wishes to continue working during this fun? The girl installs “the winter brakes,” AKA The Double Bridle. Problem curtailed if not completely solved. Of course, I cannot manage both sets of reins in puffy gloves, so I cope with cold fingers for the opportunity to stop when I want. If anyone has any winter horse survival tips they wish to share, please pass them along! As long as the footing is safe and the roads to the barn are clear, we will brave the cold and work towards our Third Level debut.